For an up-to-date view on weekly changes in the energy market, see the Haven Power market report. Falling gas prices and milder forecasts pushed the power curve downwards. Day-ahead prices followed wind output predictions, with low temperatures adding premium. Pumped storage hydro was used to increase both generation and demand. Wind output was at its lowest when demand was at its highest. Day-ahead prices averaged £61.16/MWh over a week that witnessed extreme high and low wind output, as well as cold temperatures. 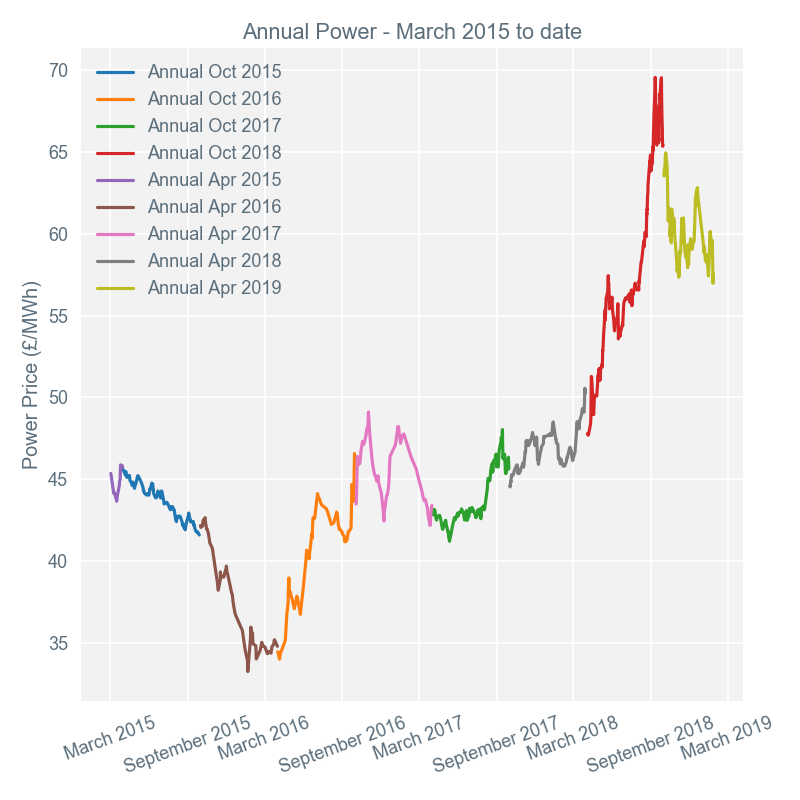 Baseload power for delivery on 24th January was the highest price (£75.28/MWh) for the week - and since 16th November 2018. The strong gains on the day-ahead market were due to very low levels of wind output expected for 24th January. This led to an increase in the corresponding gas contract due to the higher demand expected. Output from gas-fired stations made up over 50% of the generation stack for the entire day, as wind output dwindled below 2GW. Temperatures of just 2°C exacerbated the demand for gas as more consumers wanted to turn on (or turn up) their heating. 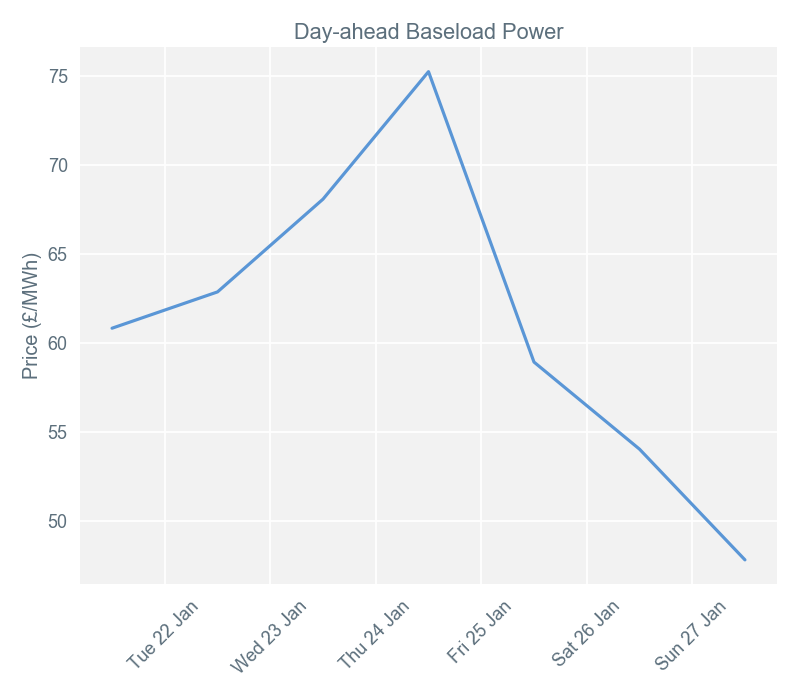 The lowest price for day-ahead baseload power delivery was for 27th January. This was when the forecast for wind output was considerably higher (averaging over 12GW), temperatures had risen to around 6°C, and the demand for power was lower. This combination meant that gas output averaged around 10GW across the day, making up between 20% and 40% of the generation stack. The highest imbalance price during week 4 was for settlement period 23 (11:00-11:30) on 24th January. With low wind output on this day, the balancing actions available to the system operator were typically more expensive. 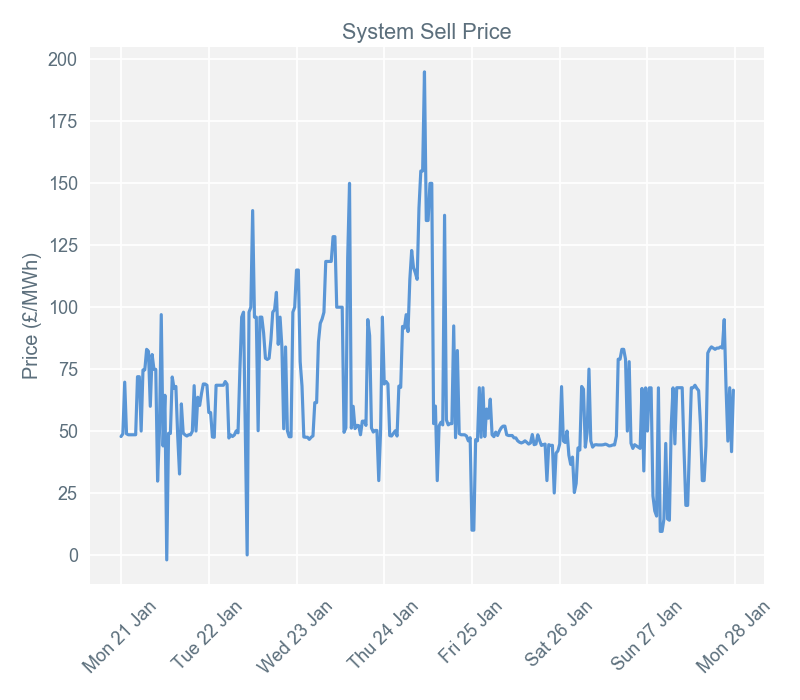 The UK system had been short of generation since the early hours, and as the imbalance increased, the cost of actions available rose too. Ultimately, National Grid accepted an offer from Ffestiniog pumped storage hydro to increase generation at a final price of £195/MWh. The lowest of the week (-£2/MWh) was the final price for settlement period 26 (12:30-13:00) on 21st January, based upon an accepted bid from Foyers pumped storage hydro plant. During this settlement period, Foyers had bids of £0/MWh accepted, meaning they were effectively consuming free electricity. However, their accepted bid of -£2/MWh meant they were being paid to pump water from the lower to upper reservoir. This event highlights the effectiveness of pumped storage in balancing the UK system on both the bid and offer sides. Output from wind installations saw large swings during week 4. High wind generation on January 21st was followed by relatively low levels on 23rd and 24th, before a dramatic increase heading into 25th and across the weekend. These fluctuations had a significant influence over the day-ahead prices, as more expensive generation was first allowed into, and then pushed out of, the generation stack on these days. When demand peaked at 44.1GW on 27th January, wind generation was contributing 12.8GW (or 29%) of the total mix. 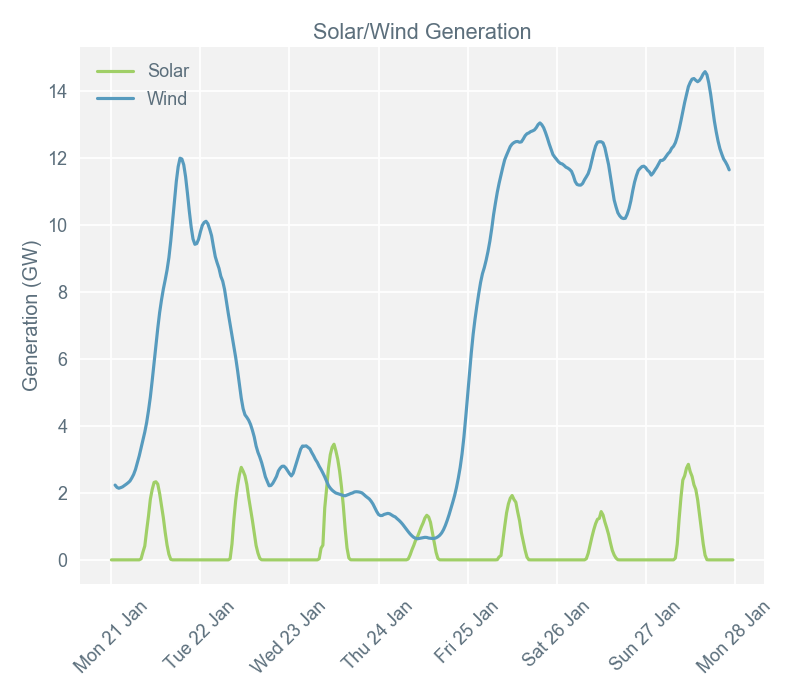 Compare this to 24th January, when temperatures and wind output were both low, demand peaked at 47.7GW, and the wind contributed just 2.6% to the generation stack. Coal and gas-fired generation picked up the slack. 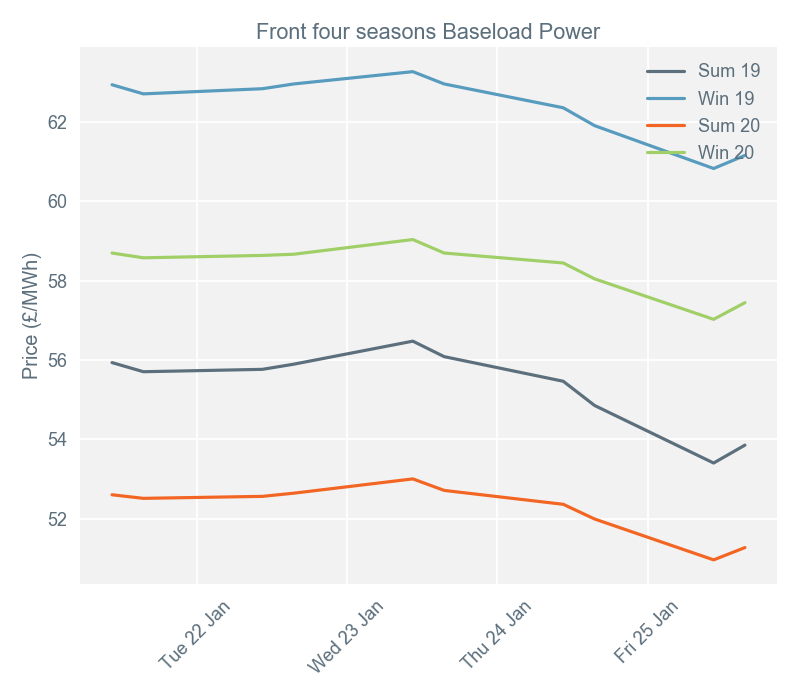 Secure and promote* (Seasons +1, +2, +3, +4) baseload contracts lost on average £1.60/MWh over week 4, reversing some of the gains made in the previous week. A bearish domestic gas market was the general theme for the week and the primary driver for curve prices. Gas supply is looking relatively robust, with milder weather forecasts removing some risk premium and an increase in Norwegian production also easing the supply picture. European coal and carbon also followed gas downwards, and helped to weaken UK power products on the far curve; bearish oil was another factor pressuring Season +4 of the UK power curve. While the above was true for the majority of the week, a different picture emerged during trading on January 23rd. On that day, a strong domestic National Balancing Point (NBP) gas market supported the UK wholesale curve. Traders priced in some premium following the news of potentially several weeks of below-normal temperatures across Europe.